After consulting with the owner of the centre the decision was to build a tree house ,mud-pit and a series of mounds surrounded by a concrete bike track. Check out the before and after shots. Natural Natural Natural. That is the request from Strathpine C&K Daycare Centre. We are using lots of timber, stone, water, sand a lovely sensory path that connects the building to the playground. We have climbing and rolling swinging and a tee-pee. Just wait and see.. The land before we start to construct the natural playground. They are some might big logs, what are they for? We are nearly there!!! and its looking magnificent. A hand water pump that leads through a dry creek to a mud-pit. It was the time for the Toddlers to have their play space re inspired. Tired and very old a complete revamp was taken on and the results were amazing. Take a look at the before and after photos to see if you agree. The swings in the Toddler play-space before the make over. Sand -pit in the Kindy play-space before make over. New swings, new Sand and Mud pit. Sandstone Timber Water done and dusted. One new play fort with a enclosed net tunnel and slide. Now that is some choices. Not shown but we also added a sensory path a bridge lots of new turf and plants. The kindy had the fence re painted and wow its a beautiful space to spend time. The old Timber Mill before work commenced. The owners had vision and determination the results are amazing. They asked us to build them a playground that the children would love. After : Forts, sandpits, recycled timber watercourse. From a double slide on a mound to a recycled timber storage shed for the sand-pit. Jetty, dry creek bed and a boat, heaven. Recycled timber from the old mill turned into a watercourse. Under the sand-pit roof you must have a family of lady beetles. The Kindergarten is located across the road from the train line and the children love to wave to the drivers and play trains. So the girls at Sarina Kindy asked us to build a timber train with a carriage. So we made one that included a tunnel to climb through and a clatter bridge to connect the engine to the carriage. Lots of ways in and out, up and down. The play space before the construction of the train. From the back you can climb up the ramp and into the carriage. It's the old sand-pit before our renovation. This is Synergy, Harmony and sits beautifully in the green outdoor space. A Sandgate Primary School Picked a huge Mango Tree and they want a Tree House built in and around the tree, we can't wait for the children to see what we will have for them on the first day of school 2016... They will climb up and over through a net tunnel or down a tunnel slide... super duper awesome. Below is a preposed sketch drawn by Artist Sara Perez, however the Tree will dictate the final design. Why don't you nominate a tree to build around? Natural Tree Balance Climb and Water-play were the order of the day at Caboolture C&K Kindergarten. Hand water pump that recycles the water in an underground storage tank and a handy log seat for casting your fishing rod into the shallow pond. We meet Lynette at the Lady Gowrie Conference in Brisbane where we had an exhibit. Lynette had a sad tale to tell when they engaged someone to work on their playground who had no idea about Australian Playground standards and did not deliver on the brief. It had to be addressed. We went out to see the play space and saw that it could be amazing. A large tree that nothing would grow around and was on a fairly steep slope cried out for multi level decks allowing safe access to the lower level. The next challenge was taking out some giant sand stone blocks from the Dirt-pit and re purposing them along side a new timber pathway. We brought in some natural sandstone boulders for the dirt-pit and added a watercourse to the dry creek bed and a lovely sandstone carved bowl to catch the water. Now it all works. In the tall circle of trees already existing we added an inner circle of boulders to make a meeting circle. We will fill the middle with large pebbles so that in winter it can be used as a family fire-pit. Moving along Lynette and her kindy staff loved the idea of a sensory path weaving between the trees and ending in a secret corner with music. This was a delight to work on. 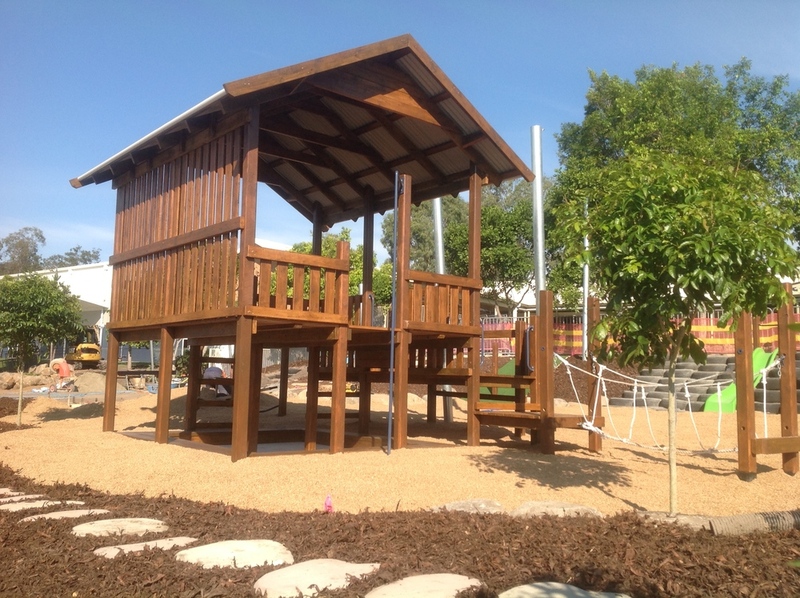 From Possum Pods to Pirate ships, This month we spent our time building a Pirate Ship in Mackay for a Childcare centre. How much fun is that... It had to have a Walk the Plank and a Fishing net, not forgetting the Ships wheel and bell and just for fun a slide as you do..
We made the trip out to visit Michelle the director at Biloela Kindy to see if we could revamp the Water Course, Take away the ancient swing frame and replace it with something strong and that would provide ample shade. After looking at the site and chatting to Michelle to see what her wish list would include. We came up with a plan. 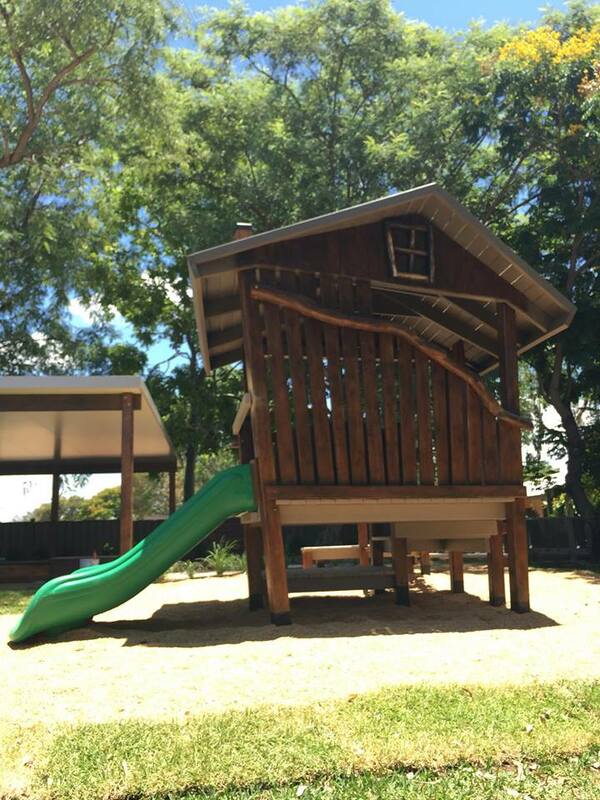 After The big hail storm in Brisbane in January West End State School had a problem with a very big tree that fell down, Not wanting to waste this magnificent tree we were able to re purpose the fallen trunk into the existing play space. The out come was amazing, the children love the challenge of connecting from one space to the next. Marni the director at Gayndah Kindergarten wanted to transform the large area at the back of their kindy into a nature path with a Log Tee-Pee, Log Tunnel, Bridge with tree branch rails. In addition we added a Sandstone Meeting Circle with Olive Trees planted around the outside of the circle that will add natural shade and a lovely place to have outdoor fun. A new Sandstone Watercourse now connects the topped up Sandpit and the Digging pit. The old Play Unit also needed an update so the area was enlarged and additional Soft-fall bark was brought in, a new Barrel Tunnel was added. A coat of Paint and some new Decking and Guard Rails and the play unit is ready for more serious fun. What was awesome was catching up with Marnie at the C&K conference in 2015, We have become like family, like so many of our clients it ends up just going beyond and that what we love. Mackenzie gives the new climb ramp a workout. Tall and Narrow, Crooked and Bent. All you need to provide a environment for the imagination to run wild.